Mitsubishi How dangerous is this? I'm wondering how dangerous this is to drive on. I'll be driving all day today at city speeds (35 mph) and tomorrow on the highway for about 2 hours. Obviously I'll cancel my plans if this is a serious hazard. Pretty sure Fleet Farm did this to my rim during a tire change, but obviously they deny it. Rear left tire, lip is breaking apart. Tire still holds air perfectly. It doesn't look like it's down to the bead so i would say if you need to drive it, drive it. That said, i would avoid any potholes, curbs, landmines, etc. Also it appears I have two different sets of rims on my car. Everything on them is identical except the lip. This one has a thin, fragile lip (along with one of the other rims that is also going bad). The other two have thick, durable lips. 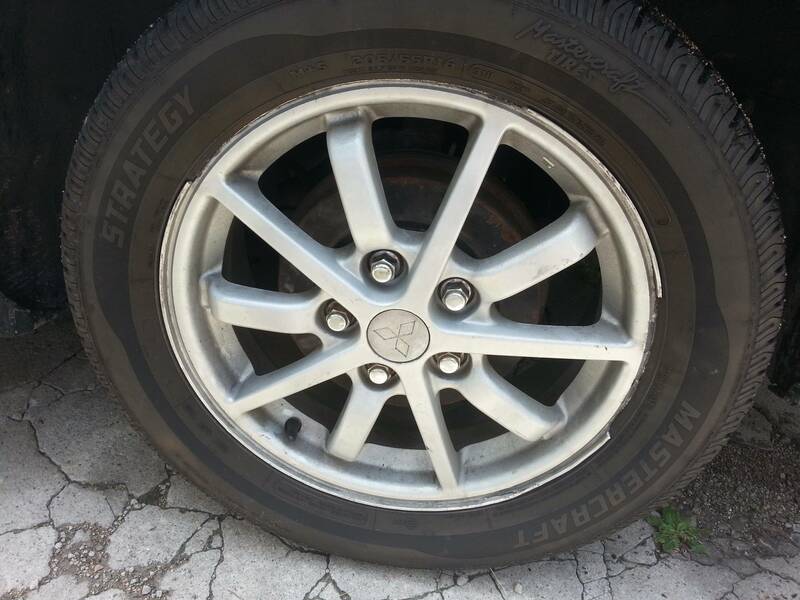 I want to order a new rim, but how do I know I'll be getting a high quality one? These ones that are going bad almost look counterfeited.